Michael Carl Adams was born March 24, 1981 in Paterson. He never knew his father and his mother, Sharon, and her mother struggled to support the family of 7 boys and one girl. Mike grew up on a dead end street in one of the city’s most dangerous neighborhoods. He learned football from his uncles and honed his skills in backyard battles with his brothers. Mike attended PS 6 and was a talented, focused student-athlete in grade school and junior high. Prior to 9th grade, a teacher at Passaic Tech across the river in Wayne—who had once taught at PS 6—called his old school and asked if there were any students who could handle the academics. Making the most of this break, Mike played high school ball for Passaic Tech, where he was a fierce tackler who could also blanket receivers in pass coverage. He also matured into an exceptional team leader. In 1998, Mike led the Bulldogs to a state title. Mike was recruited by several top college football programs, including Oklahoma and Pitt, which had signed his Passaic Tech teammate, Gerald Hayes. He opted to play closer to home and accepted a scholarship from the University of Delaware, where he figured correctly that he could step into the starting lineup. He injured his hip in the opening game of his senior year in 2002 and sat out the rest of the season. As a fifth-year senior in 2003, Mike led the Blue Hens win the Division 1–AA title. He was the star of a defense that allowed just 23 points in 16 games. Mike amassed 213 tackles and 11 interceptions during his college career. Mike was disappointed when he went undrafted in 2004. He did not project as a classic pro safety, but the 49ers invited him to camp that summer and worked his way from the practice squad to the starting lineup within a year. Playing both cornerback and safety for San Francisco in 2005, he picked off 4 passes, returning one for a touchdown in the final game of the season against the Texans. The TD tied the game at 17–17 and the 49ers won in overtime. Mike’s mother, stricken with ovarian cancer, never got to see him achieve his dream of playing in the NFL. She passed away in the spring of 2004, before his college graduation. Mike used his NFL earnings to move his grandmother to a new home and also started the Rising Stars Foundation in Paterson with Gerald Hayes, who also made it to the NFL. Mike signed with the Cleveland Browns in 2007. He played five seasons and intercepted 7 passes. He spent the 2012 and 2013 seasons in the defensive backfield of the Denver Broncos, helping them reach Super Bowl 48 with a game-breaking interception against Houston in the playoffs. Prior to the Super Bowl, Mike said he’d walk back to his old Paterson neighborhood from MetLife Stadium in the Meadowlands after the game if the Broncos won—in his helmet and pads. They were demolished by the Seahawks, 43–8. The Broncos released Mike that spring and he caught on with the rebuilding Colts. 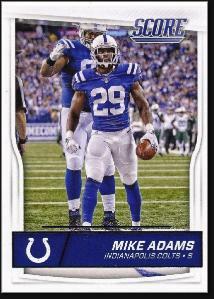 While many fans assumed he was just closing the book on a long career, Mike thrived in the Indianapolis secondary and was named to the Pro Bowl after the 2014 and 2015 seasons—first as an alternate and next as an injury replacement. He was the Colts’ starting strong safety and also saw some action as a linebacker in Greg Manusky’s defense. Mike was second on the team in tackles behind D’Qwell Jackson in 2014 and fourth in 2015, leading the team with 5 interceptions and 3 forced fumbles.